2018 Future Fisherman Foundation On-line Auction Offers a Chance to Fish with Two Legends! 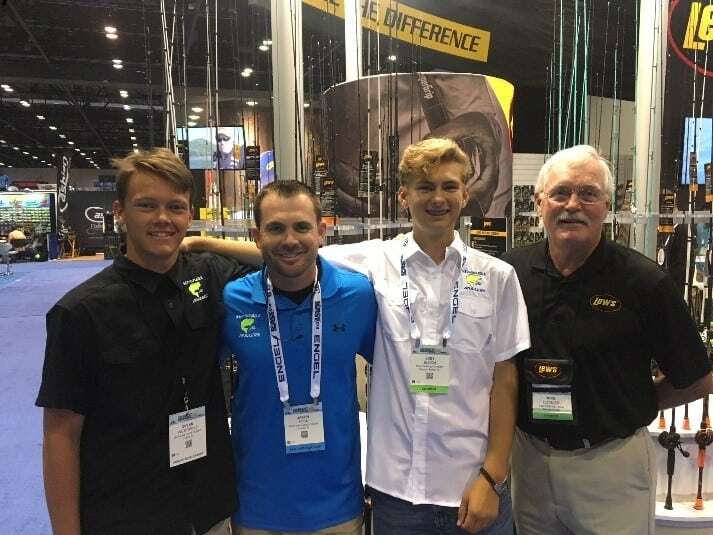 (July 24th 2018) The Future Fisherman Foundation (F3), a 501C3 Non-Profit and the Lew’s Tackle Company recently celebrated the important milestone of having issued it’s 100th High School Grant of the season last week at ICAST. The worlds largest fishing trade show showcased High School Fishing on the final of the show by inviting hundreds of High School Fishing teams to the event for the first time. During that day of celebration, Lew’s and F3 took the time to savor their programs success with Head coach Jason Foss and team members Dylan Westhelle and Joey Bloom from Oviedo High School and the Seminole County Fishing team. “Our fishing team started with students at Oviedo High School and has now blossomed into the Seminole County Bass Fishing team” stated Foss. “Getting an opportunity to participate in the Lew’s Grant program has really helped our team grow as we use the Lew’s products as prizes and raffle items at our charity tournament that we run every year. Being able to either raffle or auction off these items allows us to raise money to help cover our travel expenses to events like the High School World Finals and the High School National Championship. It also helps us if we have a student who is in need of top quality equipment but can’t afford it on their own. We can’t thank Lew’s enough for helping teams like ours continue to grow the sport of High School Fishing” added Foss. Both Westhelle and Bloom, who are both juniors at the club, also stated that the Lew’s Speed Spool reels are part of their equipment arsenal that helped this team become champions of this rapidly growing club that now supports 16 two-person teams. “The Future Fisherman Foundation is proud to partner with Lew’s on this terrific program” stated F3 Executive Director Mark Gintert. “The intent of this program was to help High School teams grow the sport of High School fishing by rewarding those groups that are trying to make a difference in their communities. Getting students off the couch and back into the great outdoors has always been one of our goals at F3 and being able to partner with a great company like Lew’s to help accomplish that goal is very rewarding for us” added Gintert. The Lew’s High School grant program runs annually from January 1st to September 30th and awards teams one of three grant levels depending on their team size and other factors that make up the grant application. Teams can apply by going to futurefisherman.org or Lews.com. Established in 1986, the Future Fisherman Foundation (F3) unites the sportfishing industry and a nationwide network of state outdoor educators, national conservation groups, youth organizations and other educators dedicated to introducing America’s youth to angling, conservation and the outdoors lifestyle. The Future Fisherman Foundation (F3) operates under The Bass Federation (TBF) umbrella of companies and is the official education arm of TBF. For more info visit futurefisherman.org. (June 20th 2018): Zebco Brands and the Future Fisherman Foundation (F3) have renewed their agreement to continue the very popular “Tackle for Educators” program launched last year as part of both companies R3 efforts to Recruit, Retain and Reactivate anglers across the country. 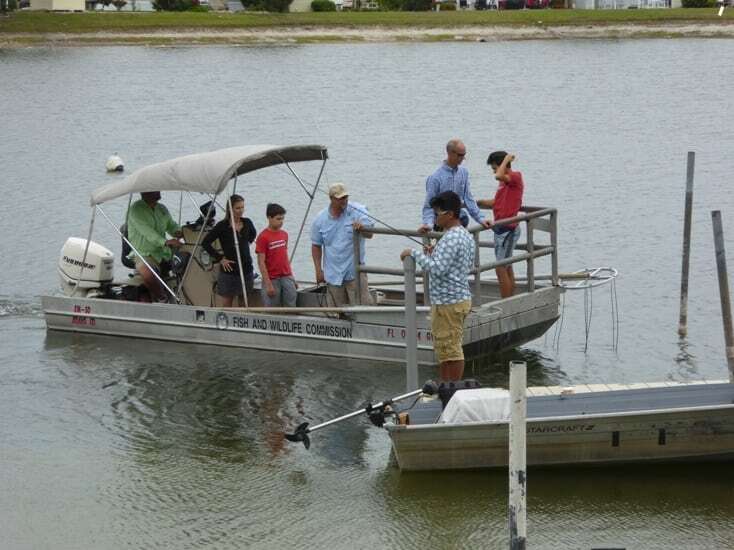 The renewed agreement is designed to put rods and reels in the hands of Educators, State Fish & Wildlife personnel as well as community group leaders who are all involved with getting young people out on the water enjoying the great sport of fishing. This program helps take the guess work out of what type of equipment they need to buy and creates four distinct packages that fit almost every budget and need. The packages range from basic spincast combos to the ultra-durable Advanced Educator kit which utilizes the legendary Zebco 33 that is built to withstand thousands of hours of use and abuse. There is literally something for everyone within these four packages and the best part of all is they are available at a substantially reduced price! Interested parties can go to Futurefisherman.org and click on the “Tackle for Educators” tab to see the four packages as well as the unbeatable pricing for each. The process is then as simple as placing your order which includes free shipping on all orders. Have a special order that you need help with? Contact F3 Executive Director Mark Gintert HERE or call 330-993-0014. Zebco Brands (www.zebco.com) in the fishing business since 1949 and based in Tulsa, Oklahoma, is a leading supplier of fishing tackle and outdoor gear sold under a portfolio of brand names. The iconic Zebco brand competes in the recreational freshwater fishing market. Quantum, Fin-Nor, and Van Staal target avid anglers from freshwater to offshore saltwater. Badlands provides packs and outdoor garments to meet the needs of serious hunters. Unfortunately, the cost of Shipping and Manufacturing does not always stay the same. While we were able to hold our pricing on some of the kits we are going to have an increase on some others going forward on June 1, 2018. I think if you compare these new prices with your cost at retail outlets you will see that this is still a great bargain and we are committed to making sure that each of you has affordable access to these great kits that we have put together. Thanks for your continued support and we look forward to providing “Tackle for Educator’s” at the most affordable price! 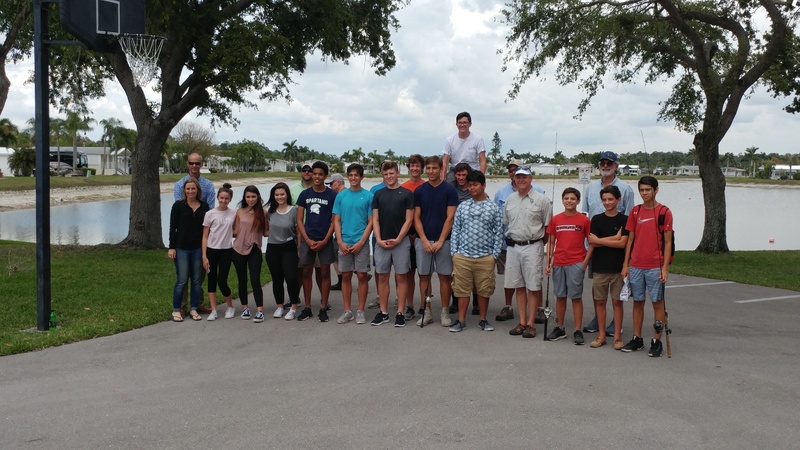 C rystal Lake RV Resort in Naples, Fla., recently hosted a day of Electro-fishing with Florida Fish and Wildlife and the Gulf Coast High School Bass Fishing Team on the resorts beautiful 60-acre lake in North Naples. The project was part of an educational venture between the Student Angler Federation (SAF), which operates the largest High School Fishing program in the country and the FWC to get more students involved in not only the sport of fishing but also the science of how and why lakes and ponds are managed by state agencies. Fifteen students from GCHS led by team coach, Heather Thornton, participated. Along with officers Matt Stevens and Adrian Stanfill from Lakeland, Fla., who operated the Electro-fishing boat for the FWC. 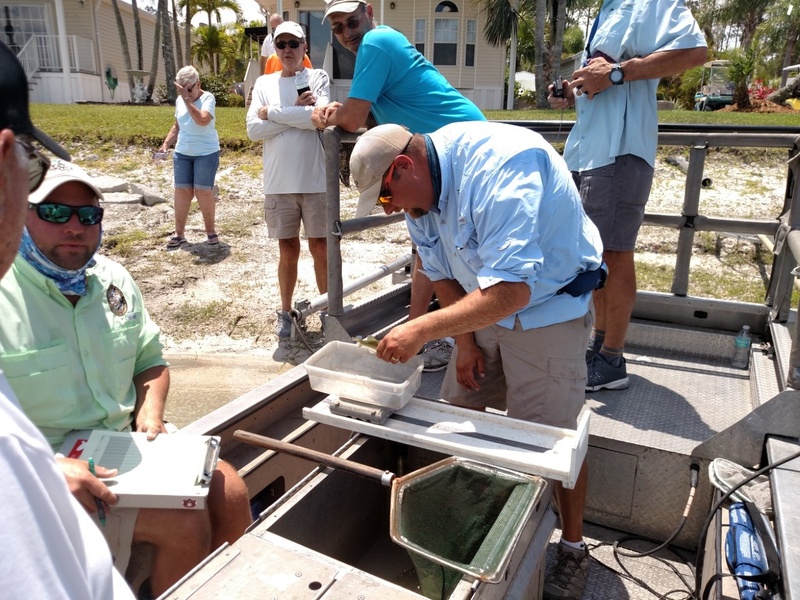 Students were up close and personal with the entire sampling process as officers explained how a generator was used to pass an electrical current between two posts extending out into the water in front of the boat as it travels along the shoreline. Any fish that gets in between the electrical field created by this process is temporarily stunned and comes to the surface. Students were then able to scoop up the disabled fish with a net as the FWC officers identified, weighed and measured each fish. Once the data is recorded the fish are returned to the water away from the current field where they will swim away unharmed. A representative sample was then created of the distance covered by the boat and the amount of time it took to cover that area. 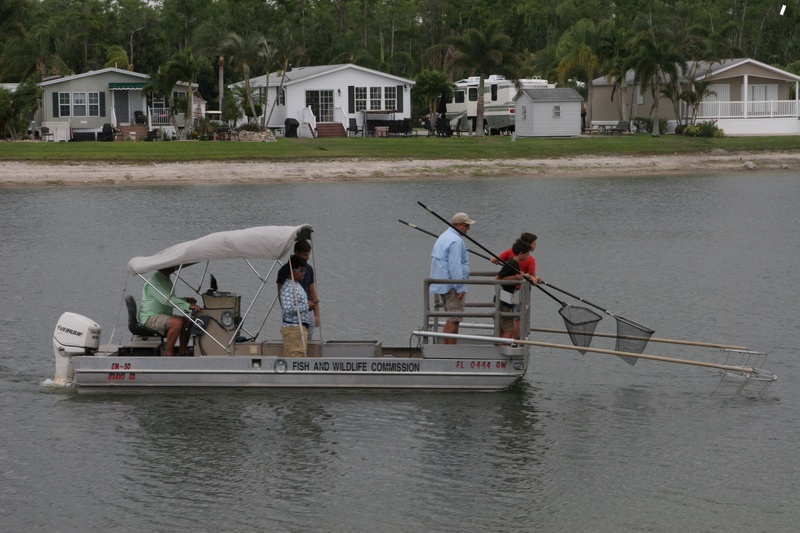 This method allows the FWC to create a sample population of how many and what type of fish are actually in the lake. Depending on the condition of the fish, they can also determine the health of the fish population and then make recommendations on how the fish population can be improved. Suggestions like the introduction of forage fish (fish that other fish like Largemouth Bass can eat), as well as, recommendations on the addition of nursery habitat structures that will protect small fish from being eaten by the larger ones are usually the outcome of such a survey. “Elector-fishing was really interesting and I learned a lot about the science and biology of the fish,” GCHS sophomore and participant, Simon Burgham, said. Also joining the FWC staff was the Chief of Fresh Water Fisheries, Tom Champeau. “The excitement, enthusiasm and leadership of the Gulf Coast High School Fishing club will attract many students to the sport of fishing as well as develop their passion for conservation,” Champeau commented. Partnership efforts like these give students, as well as, the community members of Crystal Lake a better appreciation of how FWC uses fact and science to make many of their decisions on how to manage waterways and lakes within the state. In this case, the community at Crystal Lake will take the recommendations provided by the FWC and form an action plan to improve the fish populations in their lake, ergo increasing fishing opportunities. Special thanks to Chief Champeau, and officers Stanfill and Stevens for their efforts in educating everyone involved. Students interested in learning more about High School fishing can go to www.highschoolfishing.org to see a host of exciting opportunities available in every state.